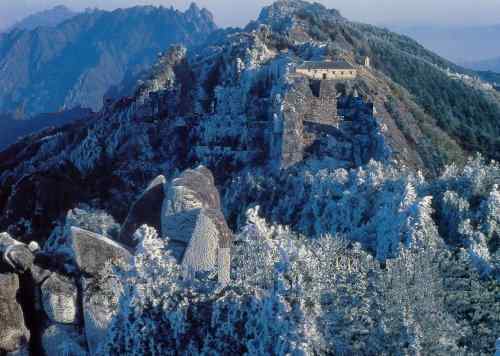 Jiuhua Mount (Jiuhuashan) soaring to 1,342 meters high in East Anhui Province , is one of the four sacred Buddhist Mountains. Jiuhua Mount is the site Rituals to Ksitigarbha Bodhisattva . On the 30th day of the 7th lunar month, a traditional temple fair is held up Mount Jiuhua to mark the passing away of Ksitigarbha. All its major scenic spots and famed temples are found within an area of 100 square km. These include 99 active temples that are enshrined with 6,800 Buddhist statues and peopled . Bading Temple (40 yuan in what the sign unfairly calls the "dull season"). QuYuan Temple houses three gilded Buddhas over ten meters tall. HuaCheng Temple is a museum housing over 2000 Buddhist relics. There are also a Buddhist monk mummy over 400 years old.